Text and accompanying Keynote slides from NEBRA Administrator JD Bilodeau's opening remarks. Just as an overview of our region- we cover the six New England states. We have 156 licensed clubs and a little under 3000 licensees- that’s racers, officials, mechanics. 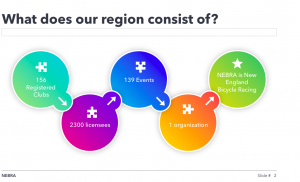 In 2018 there were 139 sanctioned events- that covers racing and non competitive events- everything from fun rides to gravel events. And of course one organization working with all of them here in New England. 2018 was the year New England really started to feel the national trend of reduced event numbers and declining participation, though we are still quite strong as a region. We have a great variety of event here and our very solid gravel/fondo component which helps in our rider day counts. Road: a total of 41 permits, which is down just one event from last year. Of those 41 we had 3 new races- including a great Shoe City Pro Circuit. 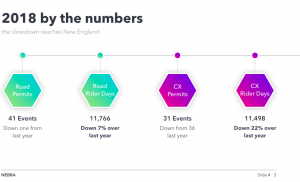 Cyclocross saw more pronounced change with 31 permits, down 5 from 2018. We had 4 new races, but a total of 9 races dropped off the calendar, and one event went unsanctioned after more than 25 years with USCF/USAC. So a little more nuance about those numbers- on the road we saw noticeable losses in road race participation, but gains in criterium participation. Lots of early season cx event losses were the core of our rider day losses, (SuckerBrook, White Park) but we are definitely on the other side of the CX bubble now. 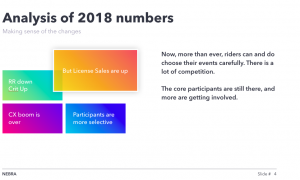 An interesting bright spot in these numbers is that USA Cycling license sales for our region are up +5% with a little over 100 more licences sold than last year. So the rider base is still there. And that does not include an accounting of the new Basic Membership introduced at the end of last year. We still see riders doing fewer race days and a bigger variety of event types- especially our experienced riders. We still see ‘events’ being chosen over ‘races’. There is enormous competition for people's time so a quality ‘event’ experience matters. The outlook for 2019 shows promise- the Plainville Spring Series returns thanks to Matt Stuart, adding 4 weeks of racing in the spring- they get us going earlier and provide a much needed early season series, and importantly a clinic every week. We are really excited to have a new Women’s Series thanks to Laura Summers- and some of those events will also offer clinics at events as well. New England Critweek is almost totally confirmed as moving to July to gain more prominence on the National scene. We have the Northeast Velodrome back up and running providing yet another venue for folks to ride and race. In cyclocross we expect to see some core events bring back our numbers. We hope to see Suckerbrook back on the calendar, the Vittoria Series remains strong and the Zanc singlespeed series provides a healthy variety to our scene. Returning new events like Gateway and Kalon Cross will help stabilize our cross scene. Last years summit was hugely constructive and provided a great path forward for the year. We learned a lot from the feedback we got and I think it has made both our organization and our region stronger. If there was one theme from last years BOD Q&A it was communication and transparency. This was something people really wanted and I think we got a lot accomplished in 2018. After last years meeting we began posting BOD Meeting Minutes for our monthly calls. We greatly accelerated our email newsletters, now averaging every two weeks and we were successful in growing our email list to reach over 3000 subscribers. We have ended our Social Media coordinator position but have continued with postings via the Administrator- we continue to have a regular presence on Twitter and Instagram along with Facebook. We continued with direct assistance to promoters though grant funding. 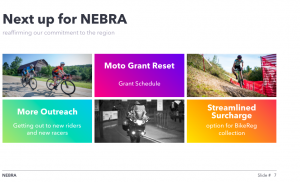 2018 saw the third year in a row that NEBRA has funded 100% of grant requests. And we increased our total grant spending by about 30%. We created a new program of officials education grants and awarded our first one to Chris DeHahn helping him to get his Cat A license. 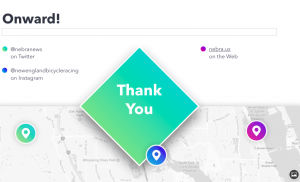 In 2019 we hope to continue making folks aware of NEBRA, continue to be a resource. We want to continue with outreach to other cycling communities- we started at D2R2 last year. We’ll be at the Race Mania multisport expo. We’ll be at Rasputitsa. We want to start getting new faces to your events and begin finding the next generation of New England cyclists. We want to continue to offer direct support to our promoters through our Grant Program in 2019. And we are going to use that Grant Program to help offset some of the officiating cost increases coming this year. Since the purpose of our grants is to offer start-up or seed money for a promoter to try something new we include a sunset provision- so that over time the grant funding decreases, the promoter assumes costs and that grant budget is freed up for other events. In 2019 we are resetting all of our ‘sunsets’ so that every promoter is eligible for full funding this year. This is especially important for our moto grants- we want to be able to help those promoters who use moto referees because they will be most affected by the mileage reimbursement rates. We will also be working to create a grant schedule- three periods in the year, spring, summer and fall so that we can tailor grants to discipline and most importantly keep the grant program information in front of our promoters. 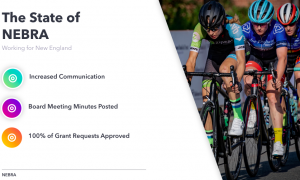 We have funded 100% of our grant requests in the last 3 years- but we want more promoters to be making requests- especially for clinics and things that bring new riders into the sport. And we want to continue to increase communication between officials and promoters- pre event checklist- crew sizes, crew requests. The new cost structure for officials means we do not want to overstaff you so Shaun and Alissa are here to help guide that process. We want to propose streamlining the surcharge system by integrating with BikeReg on a promoter opt in process. You can choose to have your surcharge automatically collected during the reg process rather than have it remitted post event. It is simpler, less paperwork- money automatically goes to NEBRA, no day of collection. This model is working in MABRA and it can work here. 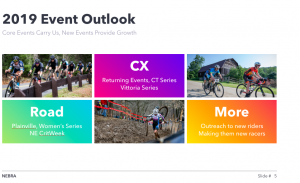 We will be working with USA Cycling to help get more marketing support for events, more value out of the club license (such as the basic memberships) and get more people aware of the region and our events. 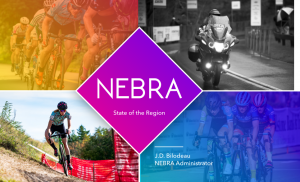 We are fortunate to have a representative from USA Cycling with us again this year and I think that shows NEBRA has a great partnership with USAC. And there is a whole lot more- NEBRA’s new president Colin Reuter is up next to go over some more details and to cover some of the structural changes to the organization. In closing I want to thank everyone again for coming out today- our greatest strength is our community. We have an amazing depth of knowledge in our region and an incredible legacy of cycling here. Working together we can continue to make New England the best place in the country for cycling.